IRS Form 5498-ESA is a U.S. Department of the Treasury - Internal Revenue Service - issued form also known as the "Coverdell Esa Contribution Information". A PDF of the latest IRS Form 5498-ESA can be downloaded below or found on the U.S. Department of the Treasury - Internal Revenue Service Forms and Publications website. plus earnings, by May 31, 2019, or you may owe a penalty. contribution of a military death gratuity) you made in 2018.
deduct these amounts on your income tax return. 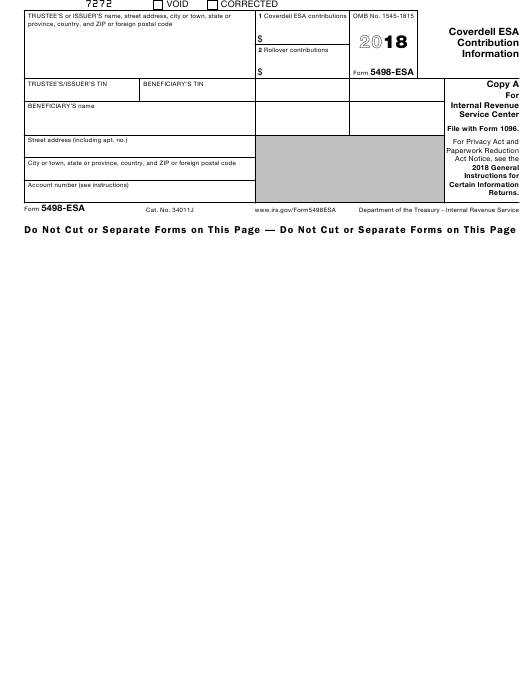 File Copy A of this form with the IRS by May 31, 2019. • the 2018 Instructions for Form 5498-ESA.